On 3 September 2000 Prof. Ir. A. Volker passed away after a short period of illness. With him, we lost an eminent hydrologist and a very interesting and modest personality. Adriaan Volker was born in Rotterdam in 1917. His father, who worked with the Volker dredging company, was often on mission abroad. As a result, Adriaan spent his primary school days in France from the age of eight. As a result he had full command of the French language and developed a lifelong affinity with the French culture. After graduating from secondary school he took up his studies at the Delft University of Technology, then named Technische Hogeschool Delft, from which he graduated in 1940. In the same year he started working at the Hydraulics Department of the Dienst Zuiderzeewerken (the governmental service responsible for the large land reclamation projects in the former inland sea in the heart of the country), later to become the head of this department. He initiated and coordinated the research activities related with the land reclamation projects, including research into: dike elevation, seepage of saline water, salinisation, dry-out of the old land, water management and in general, the impact of the works on the hydrology. Volker was famous and highly respected for his knowledge of land reclamation, throughout the world. In 1954, the Japanese government requested Volker and prof Jansen (who reclaimed the island of Walcheren after it was inundated during the war) to advise on the reclamation of the Hachiro Gata lagoon. In agreement with their advise the lagoon was succesfully reclaimed. A monument in their honour reminds us of their efforts. In 1956 Volker became the head of the Hydrology Department of the Ministry of Public Works. In this capacity he developed many activities, including: study of the salt intrusion in estuaries, the first policy document on water management and for quite some time he was member of the boards of the former committee on hydrological research TNO and the institute of applied geosciences of TNO (now NITG-TNO). He was one of the first to plead for a reduction of the pollution of the Rhine, and in particular the salt disposals. He convinced the International Commission for the Protection of the Rhine to include restrictions on both the salt load and salt concentration in the treaty of 1976. As an off-spin of the International Hydrological Decade (1965-1975) Adriaan Volker was one of the initiators of the International Commission for the Hydrology of the Rhine. He visited more than 75 countries as an advisor. He was convinced that one should share knowledge and information to gain knowledge, particularly with colleagues from developing countries. In 1957, also as a result of his efforts, the IHE-Delft was established, where education was provided to international students from all over the world in the fields of hydraulics and environment. He continued to lecture hydrology at IHE (with special attention to the hydrology of deltas) until his retirement in 1992, at which occasion he received a special award as Distinguished Lecturer of IHE. In 1965 the Delft University of Technology nominated Volker professor of hydrology at the department of civil engineering, where he lectured on general hydrology and the hydrology of deltas. In his career, Volker declined several offers for even more prestigious positions, with the argument that this would keep him from travelling and from his international advisory activities. In this capacity he was an important ambassador for the hydrological science as well as for his home country, which became well known for its water works. Besides his advisory work, he participated in activities of the ECE, OECD, WMO, FAO, UNESCO, World Bank, ECAFE, Mekong Secretariat, etc. He was President of IAHS from 1963-1967. He chaired the Council of the International Hydrological Decade from 1971-1973. He was vice-president of ICID. 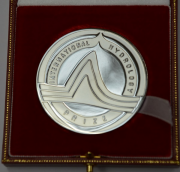 In 1984 the IAHS, UNESCO and WMO honoured him with the International Hydrology Prize. The Dutch and French governments gave him high governmental distinctions. In 1982, at the age of 65, Volker retired from government and the Delft University of Technology, but he never retired from his international activities. In the late nineties his activities slowed down, but he remained in close contact with his friends, colleagues and neighbours. With Adriaan Volker, the hydrological community loses an active, enthusiastic and colourful advocate of the hydrological sciences, an excellent engineer and a very special educator. His fascinating personality will remain part of our memories.